In order for the real estate market to come back into balance, the number of listings needs to come back down to a more normal level. A positive sign for the market in the southeast valley is that the total number of houses and condos listed for sale by SEVRAR members declined from April to May by 3.5%. 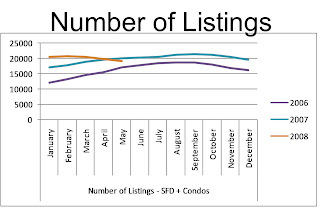 This is the second month in a row that the number of listings has declined. 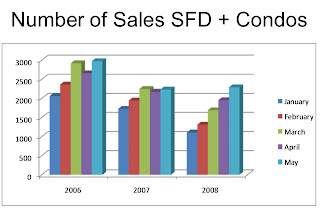 Additionally, the number of sales increased from April to May by 17% and May 2008 had 2.5% more sales than May of last year. For those buyer’s who have been waiting for the market to hit bottom, this might be the time to consider purchasing a home. No one has a crystal ball to predict the future; but, it is starting to look like the market is turning. Many home prices are now much more affordable. These statistics are for the homes listed or sold by members of the Southeast Valley Association of REALTORS® (SEVRAR). They will include sales of homes in the greater Phoenix area that were made by SEVRAR members. Even so, these statistics should be fairly representative of what is happening in the East Valley. SFD stands for Single Family Detached Homes.